1) G.O.Ms.No.57, Fin. (HR-I) Dept., dt.18-05-2015. 2) G.O.Ms.No.58, Fin. (HR-I) Dept., dt.23-05-2015. 3) From the Director of Medical Education, A.P., Hyderabad, Letter Rc.No.Spl./DME/2015, dated 25-05-2015. In the G.O. 1st read above, orders have been issued relaxing ban on transfer of employees. In the G.O. 2nd read above further amendments are made by the Finance Department. 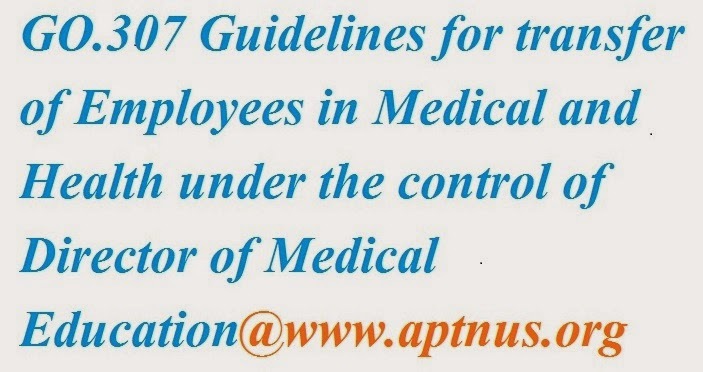 Accordingly, in order to ensure transparent procedure to provide “equitable opportunity” to all staff members, the following guidelines and procedures are issued for strict compliance. 1. All transfer and postings should be made through online on Web-site on 26-05-2015. 2. All the employees with 5 years of station seniority (as on 01-05-2015) are treated as long standing and considered for transfer as elaborated subsequently here. 3. Employees with station seniority of 2 years are eligible for request transfer subject to availability of vacancies and ceiling limit, no TTA / joining time etc., shall be granted in case of request transfers. 4. For the purpose of defining station seniority, service at the station in all cadres and in all the offices located in station should be considered. In case of urban areas, the institutions located within a urban agglomeration with the same HRA shall be counted as a single duty station. 5. Employees against whom charges are framed will be transferred irrespective of the period of service at a place. 6. The standing instructions guiding the transfers of Office Bearers of recognized employees unions issued in Circular Memo No.26135/Ser.Welfare/ 2002-1, G.A. (Services) Department, dated 19-06-2002 and memo No.17225/SW/A1/ , dated 27-09-2014 shall be followed. 7. No transfers are effected when the retirement on or before June, 30th 2016. 8. It should be fully ensured that the hospitals which are in need of specialist doctors should be given first preference. 9. It should be ensured that the transfers shall not result in unequal distribution of specialist doctors. 10. Transfer and posting of specialist doctors shall be strictly to the specialist post to which they belong. Specialists shall not be posted in any post earmarked for a different speciality. 11. Transfer of doctors who have put in more than five years in the same station will not be undertaken automatically, but only consequent on valid request for transfers by others of same speciality. Further the request can be considered against clear vacancy and in the absence of the same, by shifting the person who has put in the longest service beyond five years in the Hospital. 12. Concerned Head of the Institution can recommend transfer of employees who are disobedient, frequently absent for duty and problematic to administration. A confidential note should be prepared in each of these cases by Head of Institution and submit to the respective appointing authorities. a. Longest standing employee downwards. b. Employees with disability of 40% or more as certified by a competent authority as per “Persons with Disabilities” Act 1995.
c. With respect to husband and wife transfers, only one of the spouses shall be shifted following the prescribed procedure. Husband / Wife should be transferred only to the place where the spouse is working and in case of no vacancy available at spouse working place then nearest vacancy among the existing vacancy. d. Employees having mentally challenged children can be transferred to a place where medical facilities are available. e. Medical grounds for the diseases viz of Cancer, Heart Operations, Neurosurgery, Bone TB, Kidney Transplantation can be transferred to places where such facilities are available. The medical condition should be either self or spouse or dependent children or dependent parents. Proof of these details should personally be verified and satisfied by HoD concerned. The following information to be uploaded at their respective website. a) Names of faculty members/doctors/officers/Nurses other cadres of staff who are working in the same station continuously for more than 10 years. b) Vacancies existing in different cadres. c) Vacancies of RIMS Medical Colleges at Kadapa, Ongole & Srikakulam. d) Lists of requests for transfers. (5) Office Bearer upto President/ Secretary/ Treasures/ General Counsel Members. (6) Priority to be given to GMC Nellore, GMC Ananthapur and RIMS in existing vacancies. 14. All the procedures for the transfers i.e. submission of application, publication of vacancies, publication of list of long standing employees, publication of Merit list bases on station seniority, submission of grievances, grievance Redressal and allocation of postings should be done online. 16. All the appointing authorities shall publish the list of vacancies, list of long standing employees and list of employees exempted from the long standing category. List of vacancies should include clear vacancies, posts that are occupied by mismatches, posts of long standing employees. 17. The Medical Officers/Employees should indicate maximum of five choices of posting / place. In case of non-submission of choice of places then posting will be allocated based on the availability of vacancies. 18. Based on the (i) choice of places, (ii) availability of vacancies, (iii) merit list based on station seniority and priorities as indicated at para 13; posting will be allocated online and transfer proceedings will be generated online. 19. Appointing authorities should download the transfer proceedings and communicate the signed copies to the employees. 20. For categories to which Govt. is competent authority to issue transfer orders, proposals should be submitted to Govt. by respective HoDs. 1. Employees can submit their grievances online, if any violation is there of these guidelines. 2. Appointing authorities shall verify the grievances and redress the grievance found to be genuine. In case of the grievance is not genuine or not feasible, the same has to be intimated to the applicant through e-mail. 3. If the employee feels that his grievance is not redressed, he also can make an application to the respective Head of Department online. 3. No transfer shall be effected in the Directorates of the Director-General, Drugs Control Administration and Commissioner of AYUSH, A.P., Hyderabad.